We have memories in videos, let it be of family functions or friends. If you are youtuber it can be your youtube video. In every moment of life, we record videos, but the problem is storage. We have limited storage everywhere, let it be a cellphone, computer or external HDD. Nowadays videos are recorded in HD quality. The file size of such videos is more than normal videos i.e. file size will be approx 200 – 300 MB for 3 minutes video. It becomes difficult to back up such huge file due to lack of HDD capacity. I as a youtuber, record my videos on iPhone 7 Plus. My 1-minute video is of approx 70 – 80 MB. I and many youtubers face problems uploading it to youtube. Fully processed video of mine are of approx 600 – 700 MB and sometimes in GB. What we can do is compress large video files. There are many problems in compressing large video files. We have to compromise with many things like quality, resolutions and many other things. So, here is the tutorial to compress large video files without losing its quality. The compression ratio is up to 95%. Don’t believe it, right? But yes, we can compress video up-to 95% without losing its quality. There are many video compressor available, but we will use “HandBrake” software in order to compress large video files. This software can compress video from 300 MB to around 20 MB. So, Let’s get started with the tutorial on “How To Compress Large Video Files Without Losing Quality”. Click on Source >> Click on File and Select video file which you want to compress. Before compressing check properties. So, we can compare it with the compressed file properties. Click open. In destination click on browse and select the place where you want to save your compressed file. Give the appropriate name and click save. In preset settings, select normal as shown below. output setting: in container select “MP4”. If you want to upload your video to website or youtube, mark “web optimized”. Web optimized is usually used by youtubers. Select “picture” tab. there will cropping options in that select “custom” and change the value of “top”,”bottom”,”left”,”right” to “0”. your screen will be full screen. Select “video” tab. Select “H.264 (x264) in video codec. quality is another key point, in quality recommended is “20”. “40” will decrease quality whereas “10” will increase quality. Select “audio” tab, change “Bitrate” to 128. (optional) on right side panel, click on “Add” to save these settings. That’s it with settings, now click on Preview. I recommend before compressing any video always check its preview to save time. if you think the preview is perfect, click on “Start Encode” button. finally, your video will start compressing. let us check the properties of both the videos, original and compressed. Do share your thoughts and queries regarding this tutorial in the comment section. Hope, this tutorial is useful to you. If you find this tutorial useful, please share it on your social accounts. For more such tutorials do Subscribe Our Newsletter and for video tutorial Subscribe Our Youtube Channel. 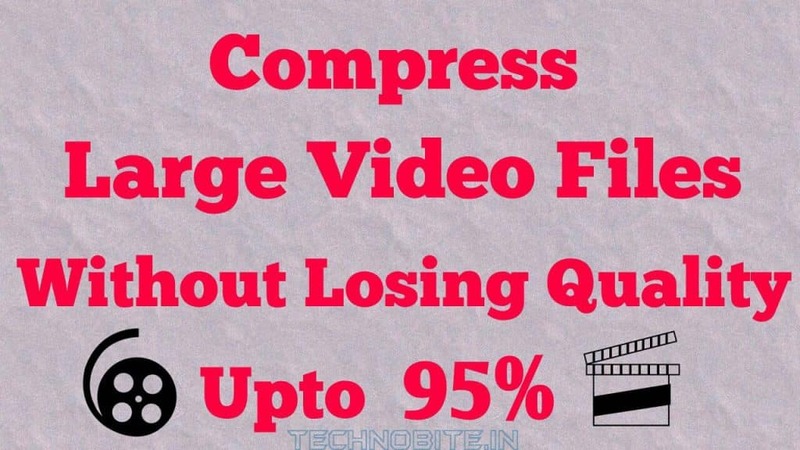 Tips and Tricks, Tutorials, Windows Tips and Tricks compress large video files, compress video, how to, how to compress videos, videos. permalink.